Making sure that your fruit tree stays healthy is very important, but not as hard as some might think. There are several vital things you need to do: don’t harvest all of the fruit on the tree at the same time; make sure the soil is healthy; watch out for pests; plant it correctly; be sure it is protected when it is young. I will expand on all of these things. One way to ensure that your fruit tree will remain healthy is to never harvest all of the fruit at the same time. If all of the fruit is left on the tree, it will grow to an unbearable weight. The combined weight of all of the fruit can get very heavy and snap the branches. So once the fruit starts to grow, you should always pick some of them before they are completely ready. Even if you don’t want to pick the fruit before it is ready, it will be beneficial to your tree. While you should do this to prevent it from becoming too heavy, you should also never over-harvest. This can be equally damaging. Another part of making sure that your fruit tree stays healthy is planting it in fertile soil. If you plant anything in soil that doesn’t have the proper amount of nutrients in it, it will not grow and flourish as I am sure you would like it to. 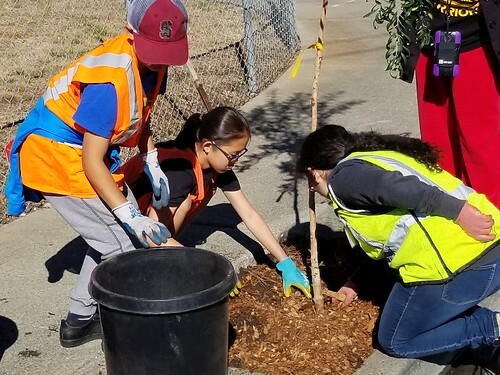 You also have to be sure that you plant the right tree in the right kind of soil, because some types of fruit trees do better in drier soil while some kinds or trees do better in damp soil. Just look up what kinds of nutrients your desired tree requires and you’ll know for sure whether to plant it or modify your soil in any way. Another way to ensure your fruit tree’s health is to watch out for pests. To help keep the pests away from your tree, try to eliminate places by your tree that pests might be living. Always look for old piles of brush, weeds, old leaves, or any other decaying matter where pests could be hiding. Another way to keep pests away is by using bug sprays and repellents. Also, regularly turn over a little bit of soil around your tree and look for pests that could be hiding underground. Sometimes the ones that are hidden out of sight can be the most harmful. If you don’t plant your fruit tree correctly, it could end up being very unhealthy. So to avoid this, always look for instructions before you plant trees. When you are planting a tree, make sure that your tree is perfectly vertical, so it won’t grow to be pointing off in an abnormal direction. When you are planting a tree you should also spread out the roots so that the tree will always be stable. This will help it live longer since the maximum water intake will be optimized. The final thing to do in keeping your fruit tree healthy is to keep it protected when it is young and fragile. When you have a young tree you should tie it to a stake to help it to survive strong winds. Don’t tie it too hard, you should always allow room for the tree trunk to grow. Another thing to do when it is young is to put a small fence around it. This can help keep it safe from animals that will eat its bark if given the chance. A fence will also help to guard the base against strong wind and other weather. Dogwoods – these are among the most popular and well-loved flowering trees that blossom in the spring. The soft white or pink flowers are indeed pleasing for to the eyes. Additionally, dogwoods also look good in the autumn as their leaves turn to a rich and bright red tinge. Having a dogwood in one’s backyard can definitely light up one’s surroundings for much of the year. Rose of Sharon – while the rose of Sharon is technically a shrub, most people think that it is a tree because it can grow tall and be trimmed down to a single tree-like trunk. Its lilac-tinted flower is very attractive. The blooms come relatively late which makes it good to be planted with early blooming trees to enjoy flowers throughout the season. Cherry, Mulberry, and Crab Apple – these flowering trees are generally grouped as weeping trees because of their teardrop-like buds. The elegant white to pastel pink flowers create a cozy ambience that is quite calming. These ornamental flowering trees add color and excitement to any panorama. Washington Hawthorn Flowering Trees – this trees are very much valued because of the distinct time when they bloom. They usually flower from the latter portion of the spring to the early part of summer which makes them ideal in the transition period between the two periods, when most spring trees have shed they blooms and most summer trees have just started budding. Magnolias – these are sometimes called saucers obviously for their big flowers that are very noticeable to anyone nearby. This type of flowering tree makes a big impression on anyone who beholds its beauty. Crape Myrtles – this tree is considered as the queen of the flowering trees in the south as it is a very popular choice for Southerners. They bloom for long periods starting from the middle of summer to autumn. The flowers bloom in clusters that can be white, red, pink or lilac, which are attached to the tips of new wood. In temperate regions, these flowering trees can die in the winter, but come back in springtime. Harry Lauder’s walking stick – this unique tree with an odd name is indeed a distinct flowering tree as it becomes beautiful only when it sheds its leaves. This is also technically a shrub that looks at a tree because it can go over four feet high. Harry Lauder’s walking street is ideal for those who have winter planting in mind. Evergreen trees and shrubs are more expensive in general than deciduous trees (trees that drop their leaves in winter). But they are worth their cost because of their year-round beauty, hardiness and longevity. Evergreens range from the broadleaved shrubs like rhododendron and laurel to the tall-needled cone-bearing pines and stately spruces. The giant spruces and firs are most effective as windscreens; the spreading evergreen shrubs are widely used not only because of their attractiveness but also because they can be shaped and trimmed and do well in the shade (such as for foundation planting). Pine is the most commonly known of the evergreens. White pine is noted for its long, soft, light silvery-green needles and rapid attainment of its 60- to 80-foot maturity. Red pine, as well as white pine, is splendid for backgrounds and windbreaks. Ponderosa pine, a broad, compact tree, is used for protection and ornamental screens. Austrian pine (black pine) with its rich, green color and spreading branches has great favor in the Midwest. Globe mugho pine is a small, rounded tree for ornamental planting. Norway spruce is probably the most widely planted windbreak evergreen. Quick growing and. hardy, it has short needles of dark green; is a compact, pyramidal shape. Black Hills spruce grows toy 40 feet in time, is hardy and drought-resistant. A slow grower, it can remain in close quarters for many years. White spruce has short, thick, light blue-green needles; it matures at 60 to 70 feet and is good for landscaping and screens. Colorado blue spruce is a good specimen tree and hardy, too, but it suffers in heat and drought. Of the cedars, red cedar is a fine ornamental evergreen for hedges and windbreaks. It withstands dry weather and the thick green foliage has a bronze in winter. Douglas fir is the best fir for windbreaks and screening. Hardy, healthy, drought-resisting, it grows quickly and compactly, and its lofty pyramid makes a good lawn specimen. Balsam fir, the Christmas tree, is noted for its fragrance and lustrous foliage. White fir, a specimen, has an attractive silvery color. Arbor vitae, like cedar, furnishes the flat evergreen branch found in flower arrangements at Christmas. It is an ornamental tree of many varieties, and is best located in moist protected places. Un-trimmed, it is a broad pyramid, 35 to 50 feet tall, but it shears to any size or shape. The juniper family is useful in planting, in tall forms such as the formal columnar juniper and the upright juniper, and as a spreading evergreen — the remarkable Pfitzer juniper—for banks, ground cover and edgings. The green feathery foliage grows rapidly; can stand crowding. Height at maturity is 8 feet, spread up to 12. Ground-covering junipers include prostrate, Sargent, Waukegan and creeping varieties. Another evergreen with feathery foliage is the hemlock. The Canadian hemlock can be sheared in a symmetrical manner. Hemlock is most effective when planted in a grove with others. Yew, with its thick glossy needles and dense, upward-reaehing branches, is useful as both shrub and tree, growing well in sun and shade. Try using it not in the usual manner as foundation planting only — but as a single handsome specimen against a wall of the garden. The low-spreading bushy dwarf yew can be clipped well. Other varieties are upright yew and Japanese yew, a tapering or conical tree or shrub used for hedges. Evergreens tend to be adversely affected by hot, dry summer weather and should be watered every 10 to 14 days at this time. Be sure the water reaches the deep-root growth, at least 6 inches deep. A mulch of grass clippings or peat moss will also protect the tree from loss of water in dry weather. Pruning in late spring before new buds appear seems to help an evergreen thrive. Prune so that the inner branches can develop and the tree or shrub is more compact. Formal trees can be kept trim, with no ragged branches sticking out, and badly shaped or deformed trees can be corrected through shaping. Evergreens are susceptible to “winterburn” from too much wind and winter sun, so that they dry up and their branches crack under the weight of snow or the force of wind. A precaution is to water them deeply before the ground freezes in the late fall. They may also be protected in winter by screens of burlap or straw mats. Where wind and winter sun are not too strong, shielding only on the sunny side is necessary. Burlap boxes or covers should be well ventilated. Thin, tall shrubs or small evergreen trees may be tied with strips of cloth, so that the branches will not crack. Old trees with heavy limbs may be propped with boards to prevent breakage under heavy snow or ice. Trees add so much to the home landscape! They provide shade, clean air, habitat for wildlife, value to your property, and even memories. If your yard does not have any trees at the moment, you may want to consider planting some. Studies have shown that trees and landscaping add value to your property. Even if you do not intend to sell your property, trees can provide years of enjoyment. If you have trees in your yard, check to see that they are healthy. 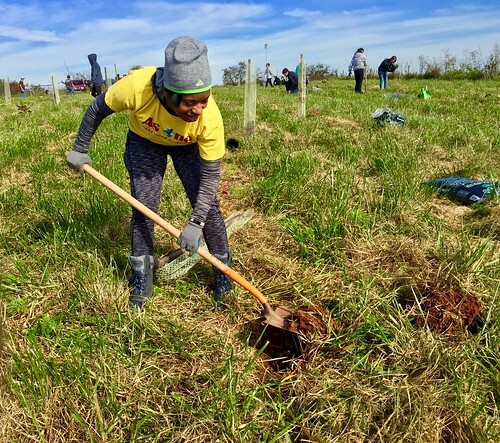 If they are near the end of their life expectancy or show signs of decline, you may want to plant new trees that will become established before the old trees are removed. If properly located and planted, trees can help control energy costs. A large shade tree planted on the southwest side of the house can provide cooling shade in the summer, helping reduce air conditioning costs. Once the leaves drop in the fall, the winter sun is free to warm your house on cold winter days. Evergreen trees, planted to block cold winter winds, can help reduce winter heating costs. Have you wondered what you could do to reduce greenhouse gases and address global warming? Planting trees will help! One of the greenhouse gases causing the most concern is carbon dioxide. Plants take this gas out of the air and use it in photosynthesis. Carbon is stored in the wood and living tissues of trees. When leaves fall and are composted, carbon is added to the soil. This improves the soil for plant growth and stores more of the carbon in the form of soil organic matter. Carbon can be stored for hundreds of years in the trunks of trees or in the form of lumber, furniture, and other wood products. 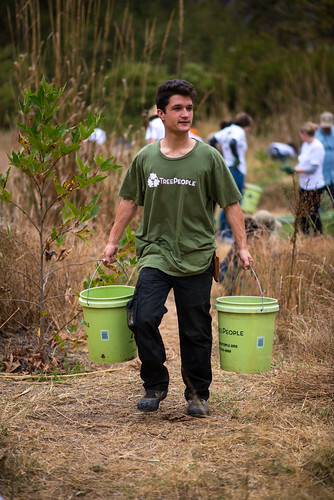 By planting trees in your yard, you can help reduce greenhouse gases. Trees also provide shelter and food for a variety of wildlife. While installing bird feeders will help attract birds to your yard, providing them with nearby trees and shrubs to escape danger, build nests, and obtain food, will be even more effective. Squirrels and other small mammals use trees for nesting sites and food sources. When selecting trees, consider what food value they may offer to the wildlife in your community. Trees can offer years of enjoyment. 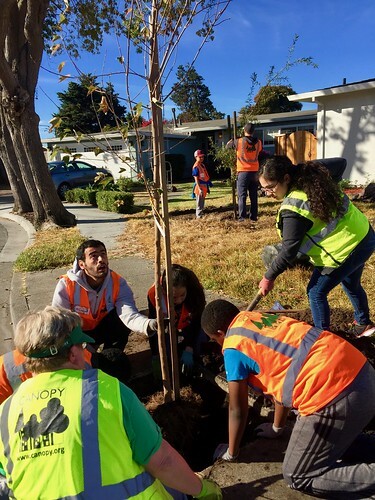 Planting trees and watching them grow can be part of your family’s memories. Consider planting a tree to commemorate a milestone in your family’s life. While raking leaves may seem like a chore as you get older, jumping in piles of leaves can be a treat for children. Hanging a swing, building a tree house, or simply relaxing under the shade of a tree on a hot summer day can be a memorable experience.